Katsuko’s first day as Kuroda’s personal assistant was a lot like being stuck in a bear trap, except that she was already down one arm so she couldn’t gnaw off the other to escape. He rejected the first cup of coffee she brought him and made her fetch him two more cups before he was satisfied. His filing system was labyrinthine and coded, and he shed no light on its inner workings before demanding she start organizing it. When she admitted, teeth gritted, that she needed his help to decrypt some of the labels, the look he gave her nearly blistered the skin of her face off. Her one-armed dusting attempt— predictably— did not meet his stringent standards. Through it all Kuroda dropped needling little comments that disparaged her competence and attitude, chipping away at her temper with expert aim. She gave up on maintaining any expression but icy blankness and plowed through his humiliating list of drudge-work like she was assaulting fortified castle walls. “My mother was actually the one who taught me to write, sir. She’s a calligrapher.” If Katsuko stabbed him in the eye with her pen, he’d probably just make her clean up all the blood with a single piece of tissue paper. She kept her head down and her gaze focused on the memo pad instead. “Mm,” Kuroda said. The contempt in his voice was thick enough to package and sell as novelty candy. The pen creaked perilously in Katsuko’s grip, but Kuroda was saved from ignoble death by writing utensil when one of his assistants hurried into the room to thrust a stack of paperwork at him. Kuroda had several assistants, some of whom manned the desks outside his office and others who always seemed to be nose-deep in his file cabinets. He also had a few runners hanging around him at all times, ready to take messages at a moment’s notice. All of his helpers had resolutely pretended not to be in the room while Kuroda put her through his razor-tongued hazing ritual. Katsuko had to respect their self-preservation instinct, but that didn’t mean she was gracious when one of the assistants crept up to her side while Kuroda was distracted. The assistant was a nervous mouse of a man with a wispy beard trailing from his pointy chin, and his anxious glances at Kuroda’s turned back did not inspire her with confidence. “Hm?” She raised one eyebrow. The assistant quivered but handed her a folder. It bore another one of Kuroda’s encrypted labels. The assistant pointed at the first symbol. Katsuko put her pen down and leaned in to listen closer. Katsuko, still studiously filling out her diminished stack of memos, and the pile of folders she’d previously been unable to organize vanished, tucked away in their proper drawers. The wispy beard assistant was also tucked away, safe behind a tower of filing cabinets. Kuroda looked at her for a moment, dark-eyed and unreadable, then called in an attendant to turn over a much larger stack on Katsuko’s desk. “I want this completed within the hour,” he said, clipped. He glanced over at the file tower the wispy beard assistant was hiding behind but declined to comment. “On it, sir,” Katsuko said, and wondered if she’d impressed him. She completed the paperwork in time, barely, and Kuroda dropped another stack on her. When she finished that, he made her water his damn plants. He had a lot of plants. She thought about drowning his cactus, but she wasn’t that cruel. More cleaning, more organizing, more paperwork. Kuroda’s paperwork system was frighteningly precise, and his files covered the minutiae of running ANBU. Every minor detail was included, from the monthly budget for kunai and shuriken to a list of clerks with high enough clearance to handle Sagara’s taxes. There was one particular cabinet that was covered in enough locking seals to make her eyes hurt, and nobody went in there except for Kuroda himself. Katsuko wanted nothing to do with it. It was well into evening by the time Kuroda released Katsuko with a grudging nod. Release didn’t mean escape, however: he handed her a stack of messy notes from his latest meeting and instructed her to make sense of them and check for typos. She tucked the notes into her sling, saluted, and fled for the door. “Ueno,” Kuroda said, when she was three steps away from blessed freedom. The world remained muffled and distant until she ducked out into the crisp Konoha night. The fresh air snapped her back into her own head and brought the cold awareness of her fury, held at bay by the iron walls of her self-control. She bade it to rest for a little while longer and set her course for home. The cat was napping on the kitchen counter when she dropped her homework back at her apartment. It slitted one wrathful eye open at her when she petted its newly groomed and washed fur, but offered no other form of greeting. She’d have to give it a name eventually. Just not now, when her jaw throbbed from how tightly she’d kept it clenched during the day. Every part of her ached to be out underneath the open sky. Katsuko refilled the cat’s water and food dishes and got ready to leave. The cat roused enough to let out a plaintive meow when she buckled her swords to her belt. It leapt off the counter and twined around her ankles, trying to herd her away from the door. The offended yowl when she shut the door behind her told her the cat was less than impressed with her excuses. She’d find an empty practice field and hit training dummies until her arms fell off or the anger went away. Whichever happened first. As the only member of Team Six without an actual assignment, Kakashi spent most of his afternoon skulking on rooftops, spying on his teammates, and brushing up on his medical reading. Genma’s old class notes were smoke-stained and brittle — “House fire,” he said with a thin smile, and didn’t elaborate — but they were legible enough, printed in the lieutenant’s neat hand. A young medic’s first attempt to sort body systems and the traumas that afflicted them into coherent lists. There were a lot of mnemonics. And a lot of unnecessary complications, Kakashi thought. ‘Front’ became ‘anterior.’ ‘Away from’ became ‘distal.’ The skin was the integumentary system. Each section of a bone had its own name and function, far beyond the force it took to break them. But Ryouma had to know it, so Kakashi memorized it. And now he knew more about flesh avulsions than he’d ever particularly wanted to. Between pages (and the occasional rooftop nap in the sun) he circled Konoha to check on his teammates. It was an old reflex. He wasn’t spying for the sake of research now. He knew who his teammates were — at least the broad strokes of them. This was to satisfy the flicker of worry that wanted, at all times, to know where they were. Preferably in a way that didn’t announce his concerns to the world, since then he’d have to drop himself in a hole out of shame. Genma divided his day between PT and paperwork, working on both with the single-minded intensity of a man who knew that his time was short and deadlines loomed. Ryouma met with Ayane in his room at the ANBU dorms. She was pale and distracted — a fact visible even from Kakashi’s distant spy nest — but she didn’t leave immediately, and when he swung back a few hours later, she was sitting next to Ryouma on the bed, reading the labels on medication bottles aloud while Ryouma scribbled laboriously on a much-corrected sheet of paper. Katsuko spent all day in HQ, only appearing to trail Kuroda to the Hokage’s palace and back again. Viewed from three stories up, the set of her shoulders looked tense. Kakashi wasn’t sure what Kuroda wanted with her, and it bothered him. Minato rarely brought up the inner cogs of ANBU, and on the rare occasions when he discussed personnel, it was Sagara, the commander, who drew the limelight. Kuroda was a footnote. Minato hadn’t appointed the man to his present office, and neither had the Sandaime. Kuroda was apparently Sagara’s personal choice for second in command. And now Kuroda was picking on Katsuko, with a methodology that was equally puzzling. Kakashi wouldn’t have chosen Katsuko for an office assistant, unless he wanted the office to burn down. He dozed on the palace rooftop as the sun began its slow evening descent, turning Konoha gold. When he woke again, the first stars were breaking through a velvet sky and his muscles felt like languid honey. He stretched, yawned, and tensed when a flicker of worry said, You don’t know where your teammates are. His chakra sense couldn’t return fast enough. He did the rounds on foot. Raidou — in his room on the officer’s side of the ANBU dorms, scowling intently at Seeing the Unseen, Yoshinaga Kenzou’s oldest treatise on genjutsu. Genma — sprawled asleep on the couch in Aoba’s apartment, a field medic’s guide splayed open on his slowly rising chest. Ryouma — still studying at home, writing brush in hand, frustratedly attempting the same ragged kanji over and over again. Ayane yawning next to him. And Katsuko, heading to the training grounds with her swords and a determined stride. No one else looked inclined to move any time soon. Kakashi considered the consequences of interrupting her after a day of extreme aggravation — then he considered the consequences of not interrupting her. Konoha actually needed its training grounds. They were less useful as smoking craters. He stopped at his room — it wasn’t quite home yet, but it was starting to feel familiar — and collected his new swords. He was already wearing his basic blacks, which were as good as any training gear, but he did take the precaution of throwing back a few mild painkillers to take the upcoming edge off. He thought the lieutenant might be proud. When he reached the outer edge of the training grounds, he wasn’t surprised to see an exodus in progress. 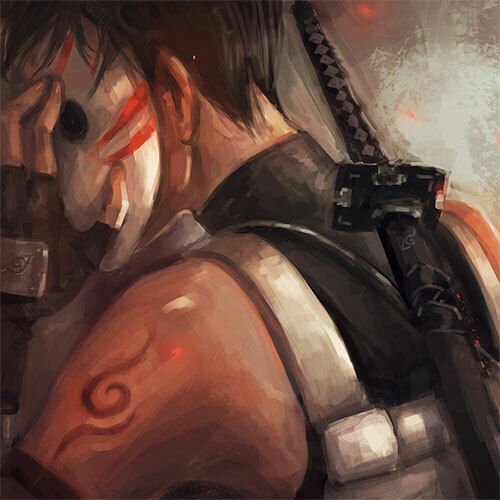 ANBU, as a group, were chakra-sensitive creatures, and even his recovering senses could feel the burn of distant death. He smiled, faintly smug. Other people’s teammates didn’t cause mass evacuations. A grizzled passerby regarded him with dislike. Kakashi saluted her cheerfully and proceeded to ground zero. There was a crater in the center of the field, where a ring of unfortunate training dummies had once stood. It was smoking gently. Katsuko stood in front of it, steam curling off her heaving shoulders. A katana in her good hand caught the last red rays of a bloody sunset. Her kodachi was still sheathed at her hip. Katsuko’s head turned slowly, the glint of one green eye barely visible under the shadow of her hair. “Shouldn’t you be napping?” she asked. It was probably supposed to be a mild question. It sounded like a growl. Kakashi readjusted his world view. This wasn’t Katsuko, his occasionally funny, frequently irritating teammate. This was Rat, the blank-faced ANBU who could skim flames down her blades and start a forest fire. Killing intent shivered in the air. A little shiver rolled down between his shoulderblades, cutting a line from intrigue to alarm. He wasn’t field-ready yet, but he wasn’t useless either. He’d fought in worse shape. He’d won in worse shape. The best training mimicked the real world. Katsuko didn’t put her sword down. Kakashi didn’t blink, but he did pause. The red thrumming edge filtered out of the air, fading as Katsuko pulled her killing intent back under her skin. The edges relaxed in her face, until she looked less like a skull, more like a person. She didn’t turn away from him. He watched — she let him watch — as she built herself back together, reforming a shinobi from bloodthirst and violence, sliding the shrapnel away. Kakashi exhaled silently through his nose, relief — but also disappointment. There would be a time, not today, when he wanted to face that revenant and see who could win. But today, he picked up his swords. Rage still howled like a wolf pack in the corners of Katsuko’s mind, but it quieted and slunk away to hide when she snarled back at it. There was no place for her bloodlust here— not when the closest person who could give her a fight was a teammate. Her recovering teammate, who’d stared down her killing intent and quite happily answered her idle challenge by proposing an all-out fistfight. One of the two of them had to act with at least a modicum of common sense, and it obviously wasn’t going to be Hatake ‘Ripped Out His Own Chakra System’ Kakashi. Katsuko huffed and motioned with her head towards another, less charred practice field in the distance. Kakashi hiked his swords over his shoulder and fell into step with her. She noted he kept her on his sighted side, watching her from the corner of his eye. There was wariness in the cant of his shoulders and the measured pace of his stride— wariness that had never been aimed at her before. Until now. That killed her anger as quick as a bucket of ice water over her head. A shinobi who lost her team’s trust wasn’t worthy of her rank. Kakashi had done nothing to deserve her ire, but he’d been caught in the wake of her fury at Kuroda. Even when he wasn’t nearby, the vice-commander still found ways to sink his barbs in her skin. His intent focus on her didn’t waver, but something eased in the air between them. A tight band of pressure around her ribs loosened. It had taken so long to earn Kakashi’s trust. To lose it now, she realized, would have been crushing. Kakashi was definitely smiling underneath his mask now. There was even an excited gleam in his eye. Katsuko hadn’t seen him this happy about new reading material that wasn’t Icha Icha since, well… never. Kakashi hung both swords at his belt before unsheathing his katana in one smooth motion, falling into a low, solid stance that was favored by many kenjutsu specialists. Katsuko circled around him and prodded his feet into narrower alignment, making him bend his front knee and straighten his back leg. He adjusted his grip and nodded, soaking in the information like an alarming sponge. She ran him through the first six techniques for the katana, Sassen to Moji Gamae, and explained the theory behind each. She didn’t know if it was because he had already learned several martial arts styles or because he was a genius, but he picked up the moves almost as soon as she demonstrated them, needing only one or two reminders before performing them flawlessly. It was not only exciting but fun, having a student so interested in her family style, whose questions and attentiveness made her reach deep into stores of knowledge she’d forgotten she had. In answer, Kakashi sheathed both swords and dropped immediately into an attentive crouch, watching her with one bright eye. Katsuko didn’t tease him; she was caught up too, eager to show him the intricacies of the style she’d been learning since she was old enough to hold a blade. Her arm was still in its damn sling, but she undid the straps and tossed the whole contraption aside. It was only practice forms, not an actual fight, and her arm could use the limbering up. She stretched a little and drew her kodachi and her katana, savoring the feeling of having a sword in each hand again, and walked to the center of the training field. The first kata, in deference to a beginner’s level, only faced her off against four imaginary opponents. Every kata was a precisely choreographed dance of attack and defense set on different hypothetical battlefields. The first kata, again in deference to the beginner, set her on the fairly easy surroundings of a field at night. Katsuko took a moment to settle herself, then bowed, saluted her imaginary opponents, and slid into the opening moves of the kata. Hyoho Niten specialized in fighting multiple enemies at once; her imaginary opponents would attack in sets of two or more, never alone. The tall grass of the field required she use broad, sweeping movements to clear her way and flush out hidden opponents, leaping high to see above her enemies’ heads. A set of crescent blocks and sweeps, yin and yang, attacking and retreating as inevitably as a storm. The first kata introduced the concept of two blades working in tandem, one sword moving to cover a hole in her guard while the other attacked and parried. She slammed the blades together in a cross-block and spun, sweeping her phantom opponent’s feet out from underneath him before beheading him as he fell. Her second opponent died two moves after the first. The ending of the kata was devoted to a game of cat and mouse between her and her last two enemies, where she traded off who was the hunter and who was the hunted in a hurricane blur of steel. It finished with a brutal leap-parry-slash, her swords gleaming under the rising moonlight. Katsuko let out a breath and bowed to signal the end of her dance, blood singing in her veins in a way it hadn’t for a very long time. It was like watching living flame. He’d seen Katsuko train, but he hadn’t watched her in a real battle yet. She’d fought outside the demon caves when he’d gone underground, and she’d been on Raidou’s team in the last mission, killing in a different town entirely. He’d seen glimpses of her skills in sparring. He knew she was fast and flexible, had deadly-quick hands, punched like a tame landslide, but she spent most of her time cracking jokes, teasing the captain, baffling the lieutenant, winding Kakashi and Ryouma up. She worked hard, but only so she could play harder. She wasn’t playing now. Every movement was pared down to its purest form, not a breath wasted. The forms were simple, but they were simple like a guillotine. Designed for death. Kakashi itched to cross blades with her. To attempt it and get it wrong would disrespect her, and her family. From half a lifetime ago, the whisper of his father’s voice rustled like yellow leaves. Ego has no place on the training field. It occurred to Kakashi that she had yet to see him fixate on a challenge, or she might have phrased that differently. “Deal,” he said, and shifted into his closest recollection of her starting pose. Like all good teachers, Katsuko couldn’t resist the bait of correcting his few mistakes. As expected, the combinations weren’t difficult as a concept, but staying in the correct Hyoho Niten stance was surprisingly troublesome. Kakashi had started with a clean slate once upon a time, but like most ninja he’d picked up an amalgamation of quirks, shortcuts, bad habits, and adjustments for his particular physiology. They worked just fine on the battlefield, where the goal was to get from point A to stabbing point B as quickly as possible, but they didn’t impress Katsuko’s perfectionist eye. The third time he bent his back leg against express orders, she kicked him behind the knee and threatened to strap a ruler to it. He growled at her, frustrated, and she growled right back, showing teeth. That startled him enough to straighten his leg on pure reflex. She approved of how he held his back and head, pressing a palm between his shoulderblades and pushing to test his spinal alignment. He had relatively little trouble with the philosophy of constant movement: Hyoho Niten emphasized a constant flow of yang strikes and yin blocks, both hands trading seamlessly between the two. Kakashi was already used to fighting with a tanto or kunai in one hand and a back up in the other. It wasn’t difficult to evolve to two swords. It was tiring, but that had more to do with his aching chakra system than the severity of the training. When his arms started to shake noticeably, Katsuko had him drop to a knee and catch his breath while she worked him through shoulder exercises designed to prevent knots. With effort, he reigned himself in. He couldn’t even blame that on Obito, though the Sharingan had definitely spoiled him with its perfect recall. He’d always craved excellence. Sometimes he wondered who he was trying to impress. “Can we work the kata now?” he asked. Kakashi shoved back up to his feet, eager. His stance was close, but Katsuko still corrected a few small details. His timing was better. The second run was at full speed. There were less corrections. The third time, Katsuko stood back and watched in silence, eyes narrowed. It was only ten movements, but Kakashi devoted the same total immersion to them that he gave every other aspect of his training, aware that the single drop of sweat you didn’t sacrifice could be the one that got you killed. When stillness returned, his muscles burned, blood thundered in his ears, and satisfaction curled around his ribs. He looked at Katsuko. She was silent for a long moment, then she tipped her head and he saw her green eyes were sparking with pride. Since another attempt today would kill him, he had to concede a less-than-perfect success, but technically perfect was something. He sheathed his swords, set them carefully down, bowed to Katsuko, and collapsed flat on his back. The night’s first stars twinkled overhead. “How many kata are there?” he asked. He flicked a glance at her stomach, where scars lurked behind her shirt. She caught the look and smiled, cat-like. “I think you can reach master’s level in five,” she said. He’d made it from academy student to jounin in eight, jounin to ANBU in five. “I’ll do it in three,” he said. Still laughing softly, she crossed her legs and sat down next to him, watching the sky fill with distant lights, until Kakashi allowed her to haul him up and help him stagger back home.